Hanan al-Khoudari resorted to Facebook in a cry for help when Israeli authorities rejected her request to accompany her three-year-old son, Louay, suffering from aggressive soft tissue sarcoma, to his chemotherapy treatment in East Jerusalem. Israeli authorities then justified their decision based on a vague claim that one of Hannan’s relatives is a “Hamas operative.” Even if an explanation is offered, denying gravely ill Palestinians from receiving life-saving treatment remains an immoral and illegal act. The World Health Organization (WHO) released a report stating that it is replenishing stocks of urgently-needed trauma medicines in the besieged Gaza Strip and providing hands-on training for health staff working in frontline Trauma Stabilization Points (TSPs). Dr. Gerald Rockenschaub said in the report that life-saving medicines and medical supplies to treat more than 100,000 people have been delivered to hospitals and TSPs. The humanitarian situation in Gaza is a managed crisis with no political resolution on the horizon. The most immediate crisis this month is for emergency fuel to sustain essential services. If there is no emergency funding, services provided at hospitals, clinics, as well as sewage treatment, water and sanitation facilities will cease. Gaza has been repeatedly brought to the brink before stop-gap aid contributions (in the case the UN) avert disaster and the political stalemate drags on, supported by the failure of the international community. The Israeli High Court of Justice denies a Defense Ministry directive preventing Gazans with ties to Hamas members from receiving lifesaving treatment in Israel. The Palestinian Center for Human Rights (PCHR) launched a video titled: “Medical Personnel Under Fire”. The video sheds lights on the serious violations committed against Palestinian medical personnel while rescuing the casualties of the peaceful March of Return. The video shows that Israeli forces used excessive force against medical staffers, which resulted in the killing of 3 paramedics and the injury of about 103 medical staffers. While the health catastrophe in Gaza is largely a result of the siege, recurrent assaults, and lack of clean water, electricity, medical supplies, as well as rampant poverty and trauma, this article in the Lancet reminds us that worldwide, “social injustice is still killing on a grand scale.” Another example is a report by the United Nations Children’s Fund (UNICEF), World Health Organization (WHO), the United Nations Population Division and the World Bank Group. New mortality estimates show that an estimated 6.3 million children under the age of 15 died in 2017 or one child every five seconds. According to the UNICEF report, the cause of death is the lack of water, sanitation, nutrition and basic health care, saying that the vast majority of these deaths, 5.4 million, occurred in the first five years of life. Newborns account half of the deaths. Excellent review of Palestinian nonviolent resistance and the Israeli response, with a focus on university education. Given repeated Israeli attacks, it is not unexpected that Israel has now blocked the entry of half of the foreign nationals who teach at Birzeit University and at other Palestinian institutions of higher learning (from Gaza’s University of Palestine to Jerico’s al-Istiqlal University). Palestinian human rights groups continue to denounce the Trump administration’s halting of all aid to UNRWA. Badil (Resource Center for Palestinian Residency and Refugee Rights) issued the statement U.S. Administration decision completely flouts the Inalienable Rights of the Palestinian People to self-determination and reparations (voluntary repatriation, property restitution, compensation and non-repetition). Rutgers University Professor Jasbir Puar was awarded the National Women’s Studies Association’s Alison Piepmeier Book Prize for “The Right to Maim: Debility, Capacity, Disability”. The book exposes the Israeli military policy of maiming Palestinians as a matter of policy. She shows how debility, (defined as bodily injury and social exclusion brought on by economic and political factors), disability, and capacity together constitute an assemblage that states use to control populations. Puar’s analysis culminates in an interrogation of Israel’s policies toward Palestine, in which she outlines how Israel brings Palestinians into biopolitical being by designating them available for injury. In its ruling on September 5th – in which the demolition of the community of Khan al-Ahmar was upheld and given approval to proceed within a week – the Israeli Supreme Court acted as if an imaginary world exists without occupation, where planners take the needs of Palestinians into account. In reality, Palestinians cannot build legally and are excluded from the processes where decisions are made; the planning systems exist exclusively for the needs of the settlers. Thus, Palestinians cannot successfully seek justice from the occupier’s courts. B’Tselem’s director urged the EU’s foreign policy high representative to back its position that there will be serious consequences for Israel if the demolition proceeds. The demolition will violate the prohibition on forcible transfer in international humanitarian law, constituting a war crime. Palestinian poet Dareen Tatour is being imprisoned in an all-women security ward in northern Israel, accused of using facebook to incite violence. The Israel Prison Services (IPS) are preventing Palestinian poet Dareen Tatour, who was sentenced last month to five months imprisonment for incitement to violence, from receiving family visits, say her family members. Her case drew international attention, including a global campaign for her release. In late August/early September, the United States cut funds to Palestinian aid. Health in the Occupied Palestinian Territories may be at risk due to funding shortfalls, following the US’ announcement on August 31 that it would be cutting $300 million in funding this year, funds which had been allocated for the UN Relief and Works Agency (UNRWA) for Palestine Refugees in the Near East. On August 24, the US announced that $200 million in funds designated for relief programs in the West Bank and Gaza Strip were being cancelled and on September 8, the US announced that $25 million earmarked for the 6-hospital East Jerusalem Hospital Network was being cancelled. In addition, on September 14, $10 million in funds for programs that had been designated for “people-to-people reconciliation activities” that bring Israelis and Palestinians together were restricted to use for citizens inside Israel only. Pierre Krähenbühl, UNRWA commissioner-general, said in an open letter on September 1 that the US cuts “represented an evident politicisation of humanitarian aid”. UNRWA’s health services are the only source of care for many Palestinian refugees, serving approximately 5 million Palestinian refugees, employing more than 3300 health staff, and operating 143 primary health facilities in its 5 areas (Jordan, Lebanon, Syria, the West Bank, and the Gaza Strip). More than 3.1 million refugees accessed UNRWA care in nearly 9 million patient visits last year. New York Times describes this as a vengeful and short-sighted act. 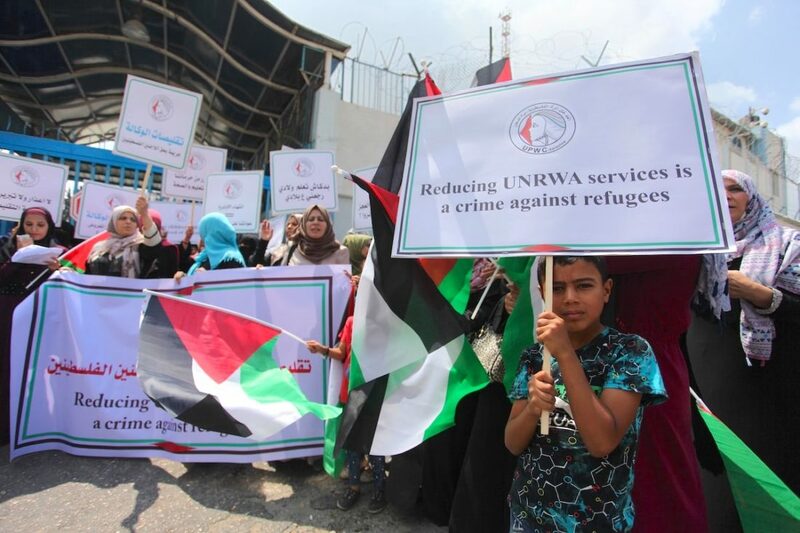 In a similar pattern, the US is questioning the number of Palestinian refugees and the right of return while attacking UNRWA. U.S. Ambassador to the United Nations Nikki Haley appeared to question the world body’s count of Palestinian refugees, the latest in a series of steps by the Trump administration challenging how relief aid is delivered to the Palestinians. The Researching the American-Israeli Alliance group, in partnership with anti-occupation group Jewish Voice for Peace released a report detailing the ways in which exchanges between the US and Israeli state security agencies have reinforced a “security model that justifies flagrant human and civil rights violations” in the wake of the 9/11 attacks. This model, which relies on civilian surveillance and racial profiling along with suppressing public protests and critical social movements, does not target potential foreign enemy threats but civilian population and minority communities. “While framed as an opportunity for U.S. law enforcement to learn policing strategies from a … democracy with counter-terror experience, in fact, these are trainings with an occupying force that rules a population deprived of human and civil rights,” the report contends.